Kay Francis, born 113 years ago today, is perhaps something of an acquired taste for modern audiences. One of the biggest stars of the 1930s, she was largely forgotten until Turner Classic Movies, bless their hearts, helped to revive and renew interest in her career. For our part, we happily watch virtually any picture that features her name in the credits. 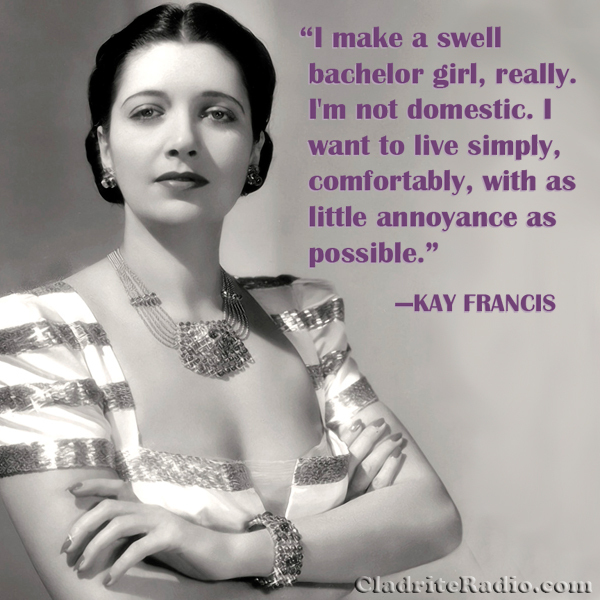 In Their Own Words: Happy birthday, Kay Francis! We’ve shared in this space before how fond we are of actress Kay Francis‘s oeuvre. Her movies, once called “women’s pictures,” would likely be dubbed “soap operas” by most observers today, but whatever tag you choose, the chance to see Kay suffer (she almost always suffered), adorned all the while in elegant gowns designed by the likes of Orry-Kelly and Adrian, is one not to be missed. Today marks our Kay’s 110th birthday. She’s brought us much enjoyment over the years, and we’re happy to remember her on this day.